Each year at Christmas, Gloriae Dei Cantores celebrates the "dawn of redeeming grace" with a traditional candlelit Service of Readings and Carols, retelling the stories of Christ's birth that stir us with memories and hopes for peace and love. Just for a time as you listen to these carols and stories, let your heart fill with gratitude for our many blessings, and with goodwill toward others. 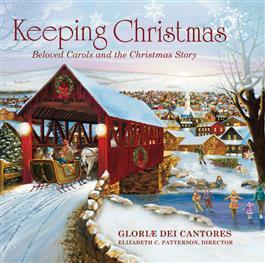 Gloriae Dei Cantores offers this recording with a prayer that the joy of the season brings you renewed hope and a fresh sense of wonder! Gloriae Dei Cantores (Singers to the Glory of God) holds a passionate dedication to the faithful representation of spiritual and musical authenticity in the choral arts. Sharing its vision of inspiration and hope, the choir has touched the hearts of audiences in twenty-four countries in Europe and Asia, as well as extensive tours and concert series in the United States. The choir's catalog of more than fifty recordings showcases an expansive repertoire, encompassing both masterworks and rarely performed musical treasures from Gregorian chant to the twenty-first century. Richard K. Pugsley and Gloriae Dei Cantores have garnered high praise for bringing lesser- known, yet fully deserving composers and their works to light. The choir makes its home at the Church of the Transfiguration in Orleans, Massachusetts, where it sings worship services throughout the year.